An immediate and impartial investigation into the shooting down of MH 17 is the need of the hour and those responsible for this cowardly act of murder need to severely punished. 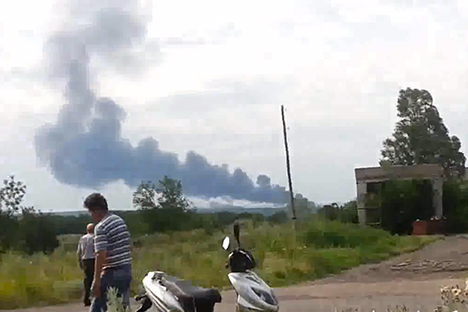 In what is one of the most shocking and deplorable acts of international terrorism this year, a Malaysia Airlines passenger aircraft with 295 innocent civilians on board was shot down over Ukrainian airspace and close to the border with Russia. Without even a shred of evidence, the authorities in Kiev have already started pointing fingers at the separatists in the country’s east. At this point in time no one really knows who shot down MH 17, which was on its way from Amsterdam to Kuala Lumpur. Whether we’re Russians, Ukrainians, Europeans, Indians or Americans or just plain and simple human beings, we need to stand by Malaysia and the families of those who perished. The families of 295 people, most of whom probably had nothing to do with the conflict in Ukraine, are suffering from an inconsolable loss. As someone who considers Kuala Lumpur a home away from home, this tragedy hits close to the heart. In the case of the “vanished” MH 370, which was flying from the Kuala Lumpur to Beijing, no one knows what happened. Here, it is looking abundantly clear that this was a targeted attack. After going through a baptism by fire, Malaysia is now a model country, when it comes to racial and religious harmony, celebration of diversity and proof that multiculturalism works if managed properly. The hospitality extended to visitors, whether in a small village known as a Kampung or one of the distinct Chinese or Tamil dominated enclaves in Malaysian cities or settlements of indigenous people is something that can hardly be matched anywhere in the world. It’s terrible that such a gentle and wonderful people have had to suffer the second air tragedy in a span of a few months. Several conspiracy theories are already doing the rounds about what happened to MH 17, but this is a global human tragedy that affects each and every single one of us. An immediate and impartial investigation needs to be launched to find out who was responsible for the shooting down of the plane. Like most journalistic observers of the events in Ukraine, I have no clue what is really going in the southern and eastern part of the country. I seriously doubt that a rag tag bunch of fighters in eastern Ukraine have the technology to shoot an aircraft that was flying at over 33,000 feet above sea level. Of course, only an impartial and thorough investigation will help us know the truth. To ensure that such a ghastly incident doesn’t take place again over the volatile eastern part of Ukraine, a no-fly zone needs to be declared. It would be utterly irresponsible of commercial airlines to fly over a war zone. In fact, it’s surprising that international airlines were flying over the area for the last four months despite intense fighting between the Ukrainian army and the rebels. At the end of the day, the world needs to see the fighting in eastern Ukraine for what it is- a civil war. One can only hope that this incident isn’t used as the next excuse to increase the on-going East-West hostility. The simple fact is that Malaysia has absolutely nothing to do with the events taking place in Ukraine. It’s a country that chooses to not get involved in matters outside its neighbourhood. The world owes it to Malaysia to jointly track down the culprits behind this act of terrorism. These cowardly savages, whoever they may be, need to be punished in the most severe way. Just like we were all New Yorkers when the 9/11 attacks took place, today, we all need to stand by Malaysia and declare that we’re All Malaysians. Hours after the crash, it is clear that the 154 Dutch nationals were killed in the tragedy, along with 27 Australians and 11 Indonesians, as well as many people from other countries. This is a truly global catastrophe and the world needs to stand united in this time of grief.